Speedway, Nellis Dunes, or one of our many other attractions." 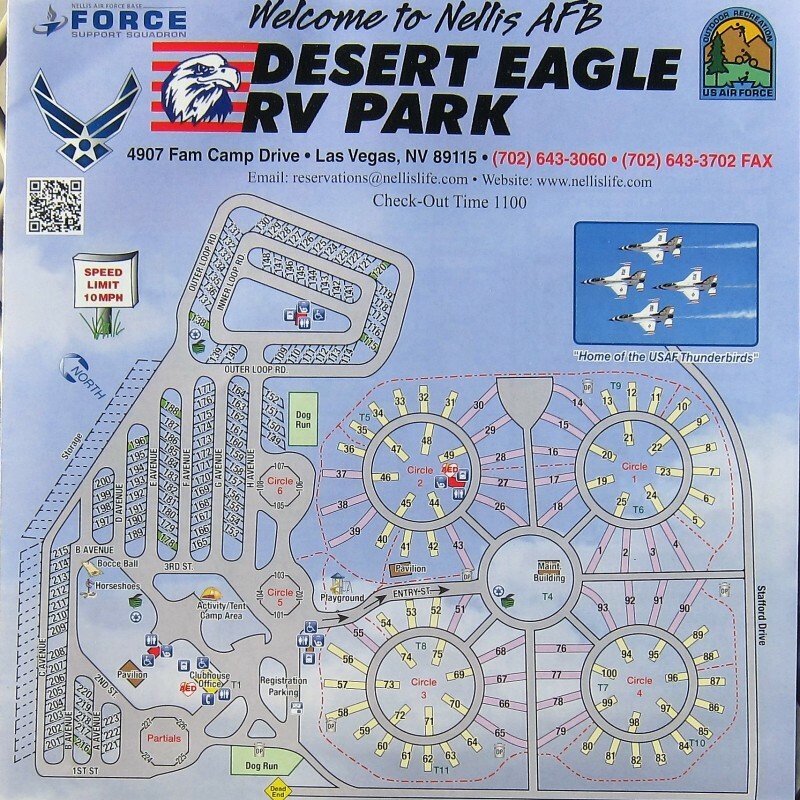 This was our second and longest time to stay at Desert Eagle RV Park at Nellis Air Force Base in northern Las Vegas, NV. We really liked this campground when we first visited in April, 2016 but we weren't there long enough then to see some of the sights listed in the quote above so this time we stayed for two weeks. We have zero interest in the Vegas Strip but we did go to Hoover Dam, Mt. Charleston, Springs Mountain Recreation Area, and the Thunderbird Museum, which we didn't do three years ago. It was fun to see some places that were new to us. I'll have entries on those places, as well as Lake Mead National Recreation Area, Valley of Fire State Park, and Red Rock National Conservation Area. Those were repeat visits for us because we enjoyed them last time. A partial government shutdown that was in effect during our stay at Nellis AFB had an impact on several places we wanted to go while we were in the area. We were able to drive through the three recreation and conservation areas despite the shutdown, but no one manned the entrance stations and the visitor centers, bathrooms, campgrounds, and some other things were closed. 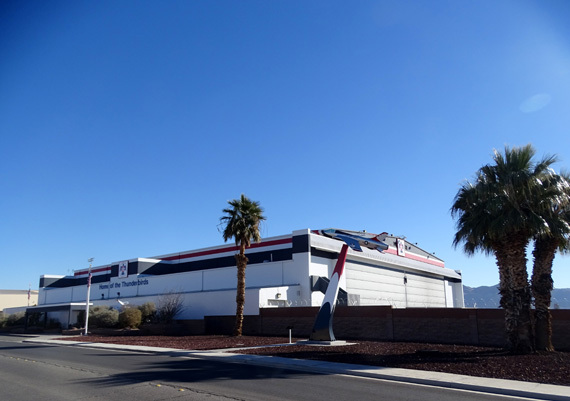 This entry will feature the drive from Camelback Ranch in Glendale, Arizona to Nellis AFB in Nevada; information about Desert Eagle RV park, including additions since we were here last time; and our visit to the USAF Thunderbird Museum (shown below), which was closed for renovations when we were here in 2016. The Thunderbird Museum wasn't affected by the government shutdown but I think their aerial demonstration schedule was. 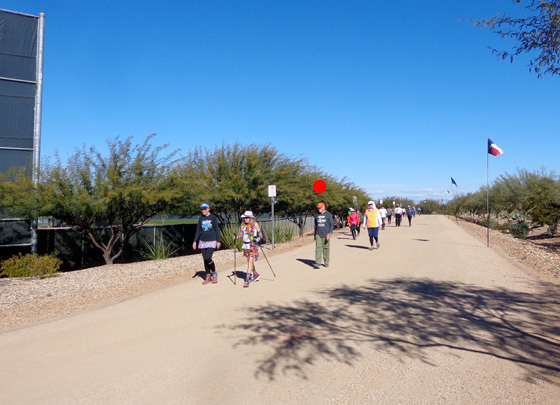 Jim finished his 100-mile walking event at Across the Years (ATY) at Camelback Ranch about 4AM on Sunday, got a couple hours of rest in our camper, ate breakfast, and prepared to leave the venue. We drove out fifteen minutes before the next wave of runners began their events so we could avoid driving past them on the few hundred yards where we'd be sharing the course. As tired as he was, Jim insisted on driving first because he wanted me to navigate through the western side of metro Phoenix until we got on US 60 heading northwest to Las Vegas. Yes, we had our GPS running but we can't always count on it. I'm still old-school and like to use paper maps as supplements to what "Gabby" is telling us to do. Jim was able to stay awake and concentrate on hauling the 5th-wheel but after about an hour his hands started cramping from lack of fluids and he had to pull over. 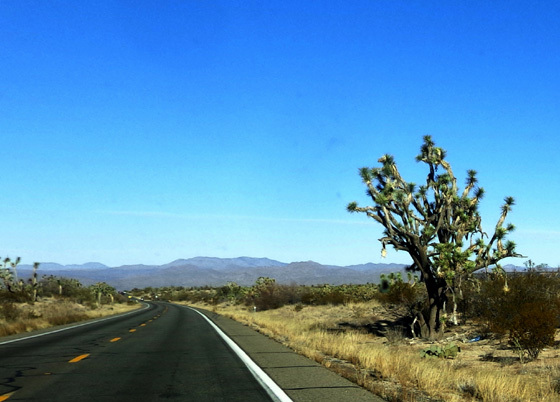 We followed scenic, hilly US 60 and US 93 through western Arizona. US 93 morphed into I-11, then I-515 in metro Las Vegas. 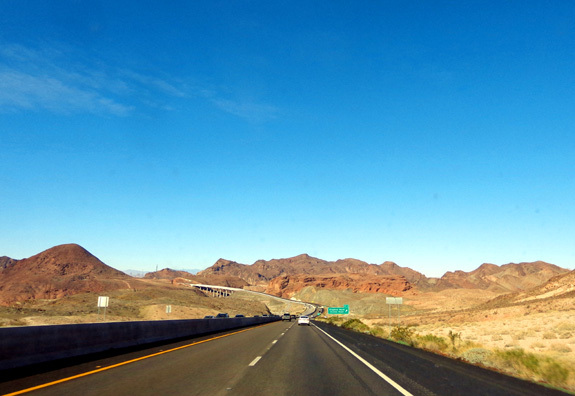 We took I-15 north through the city to exit 48, east on Craig Road, north on N. Las Vegas Blvd., left on Range Rd. and into the gate on Nellis AFB that leads to the RV park. This route is faster than it may look on a map. Most of the roads are four-lane or have passing lanes to get around slower vehicles like ours. 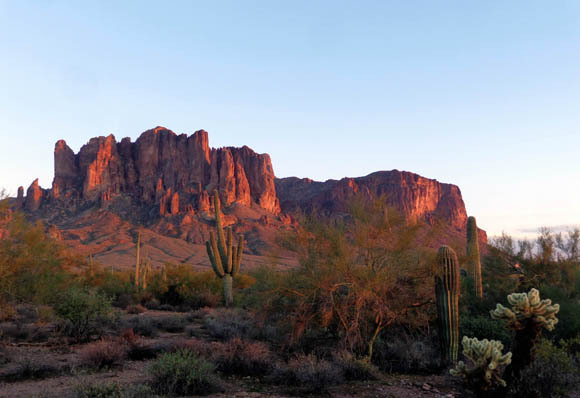 The only slow parts are through iconic old Arizona towns like Wickenburg and Kingman and the area near Hoover Dam and Lake Mead. It was our first time using most of this route. Despite the long ups and downs, it's fine for RVs of any size as long as the roads are as smooth as they are this year. On a pretty Sunday afternoon at the end of the holiday week we could see a large crowd at the dam overlooks and down at the dam itself. 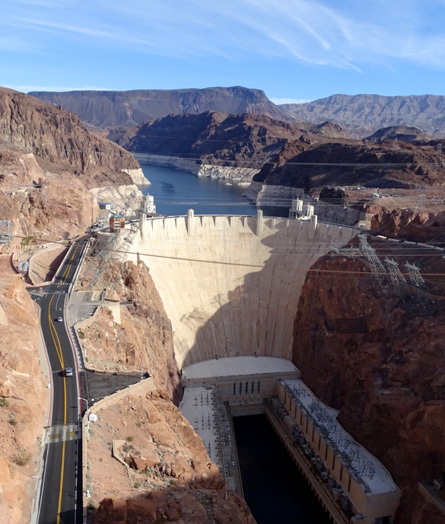 We knew we'd have to visit the dam on a weekday while we were at Nellis, not a weekend. 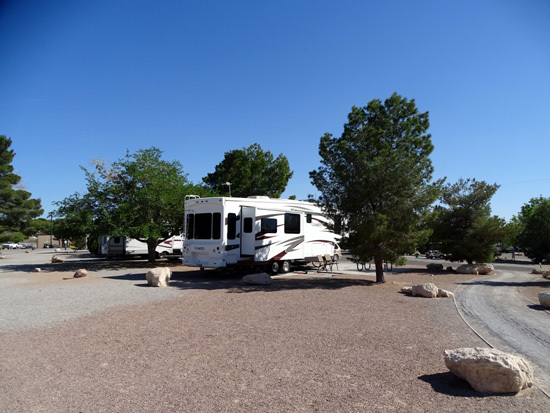 Like almost every military RV park or campground where we've stayed, you either have to have a military connection -- active duty, reserves, retired, DoD employee -- or be a guest of someone in those categories, and then only on a space-available basis. This time of year, when Las Vegas isn't an inferno, no guests are permitted in this RV park and you pretty much need advance reservations to get a spot even if you're military-related. 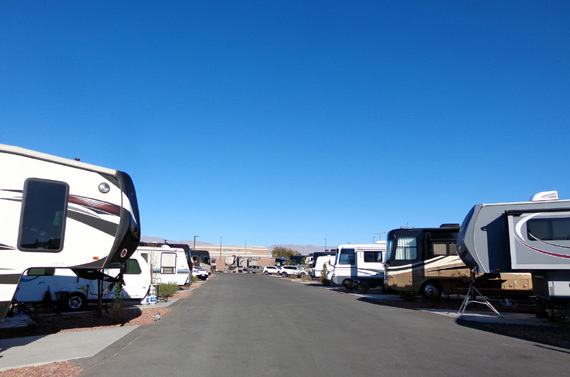 The partial government shutdown that occurred while we were at Nellis AFB caused this RV park to be even more crowded than normal in January because national park campgrounds and national forest/BLM camping areas were closed. 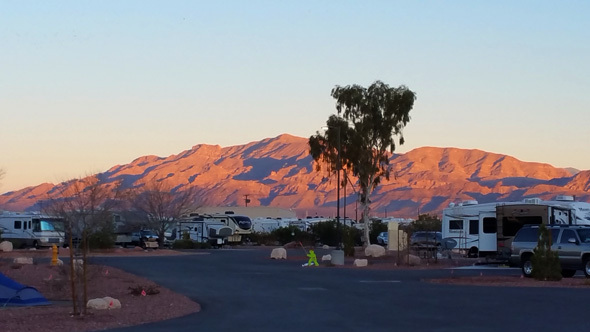 Campground hosts working in the office told us they had to turn away some military retirees who needed another place to go during the shutdown because this RV park was already full almost every day. These older sites used to be occupied by mobile homes before the area became an RV park. At that time about 40% of the sites were situated around six small circles of grass with RVs parked "wagon-wheel" fashion around the perimeter, usually with their doors toward the inside grassy area. Unfortunately, that's where the utility hookups were located, not off-doorside where you wouldn't trip over them or smell the sewer! In addition, the off-doorside was right on the campground roadway. There was no privacy, no room (campers were parked pretty much bumper-to-bumper), and no safe exit if you had your door toward the outside so the utility connections were on the correct side. 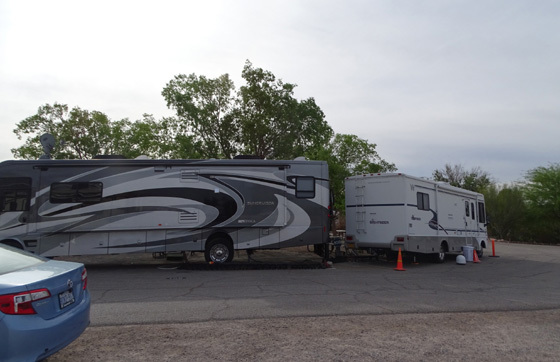 The rig on the left had its door facing the grassy circle but the occupants had to run their power cord, water hose, and sewer hose under the RV to hook them up -- near their door. Yuck! The motorhome on the right parked so its hookups were on the correct side but the occupants risked getting run over every time they stepped out their door onto the campground street. I felt sorry for everybody that had to park in the wagon wheels. We knew before our arrival this year that only two of the original six wagon wheels were left, designated Circle 5 and 6 on the diagram below. Now there are just four spots located around each of those two little circles, not six or eight spaces as in the past. Most of that area has been nicely re-landscaped and dozens of new pull-through sites were built there and on some adjacent vacant land. The older, larger sites radiate in or out of Circles 1 through 4 on the right side of the diagram. Our site in 2016 is marked with a green dot; I used a purple dot right above it to mark our current site. 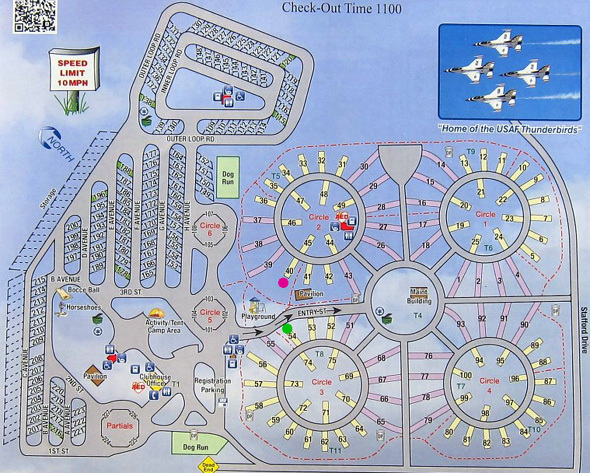 Two of the old wagon-wheel circles (5 and 6) and dozens of new pull-through sites are on the left side of the park map. 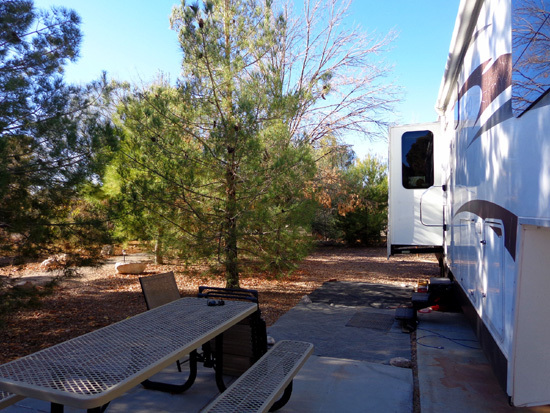 The bad news, in our opinion, is that the new sites are uncomfortably close together, sometimes with one site's sewer connection right next to the adjacent site's RV door and picnic table. It's bad enough if you're sitting next to your OWN sewer connection; it's worse if it's your neighbor's!!! You can see in the diagram above how tight those spots are compared to the ones in the large circles on the right. The new sites are definitely better than those old wagon wheels but still not where we'd want to park even overnight. Reminds us of some poorly-designed RV parks we've visited around the U.S. and Canada where the owners just try to cram as many sites into the available acreage as possible for higher revenue. 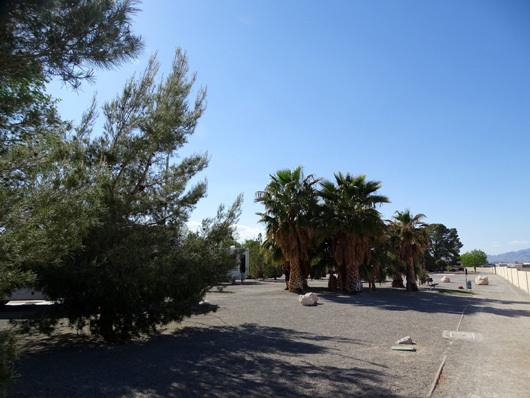 When you reserve a spot even the max of six months in advance at Desert Eagle you can't reserve a particular site or even request to be in the old area in a large site. Those tend to be reserved for seasonal visitors in the winter and we were only going to be there for two weeks. We fully expected to be in one of the narrow pull-thrus in the new section. This site was perfect for us and the dogs. I liked it even better than the one we had previously. Our cost was $24/day = $336 for two weeks for full hookups, 50-amp electricity, and WiFi, although we used our unlimited Verizon mobile hotspot for security online. We really appreciated having a sewer connection because Nellis was the only place on this trip where we had that amenity. 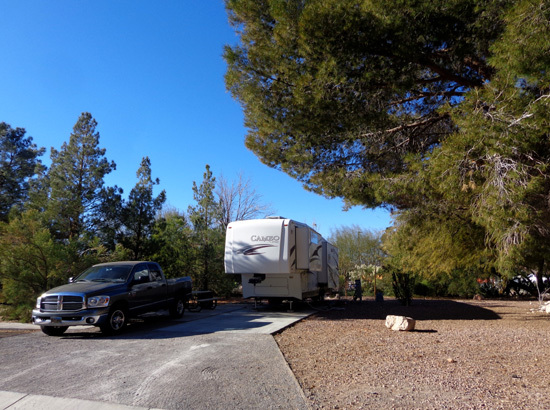 I wrote in 2016 that Desert Eagle puts the "park" in "RV park." It has beautiful mature landscaping in the older area where we stayed. Although there weren't as many flowers in bloom in early January as there were when we were here in April three years ago, the place is still green and very attractive in the winter. Lots of folks spend the whole winter season here, although it gets colder than places farther south where many RVing snowbirds prefer to stay. 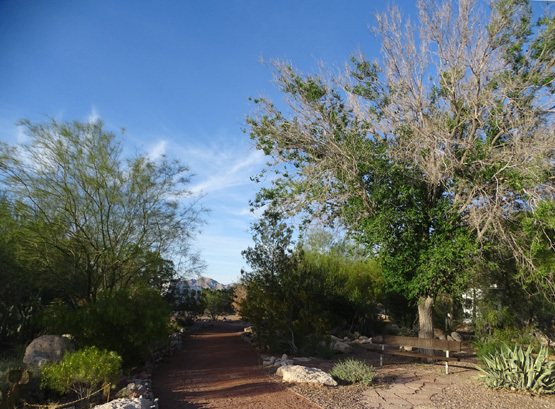 In addition to the trails we hiked off-base, we got out a couple times every day to walk the dogs on the path around the perimeter of the "old" part of the RV park (next picture) and through rows of new sites. 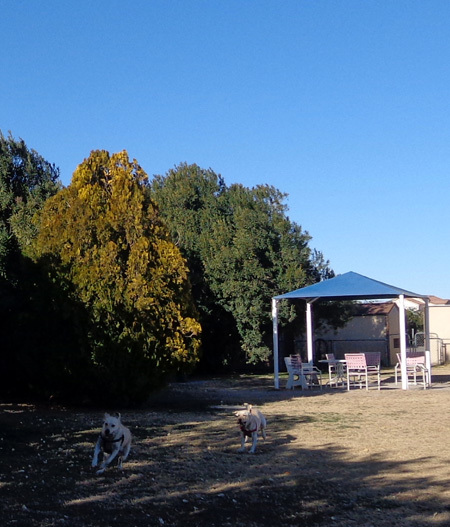 We also used a relatively small fenced dog park near the office a few times. Despite our great campsite, we didn't have as good a time while we were here as we'd hoped. There were quite a few frustrations including the weather (unseasonably cold), the partial government shutdown, a couple cranky campground hosts, inadequate laundry facilities because the campground was so full, appointments that got cancelled, poor internet connections with both our mobile hotspot and the campground WiFi, various truck and camper issues I'll discuss at the end of the trip, and all the water in the RV park being shut off the last two days we were here. Some folks who didn't want the inconvenience for the six days the water was shut off griped about it and moved to motels for the duration, then came back. No refunds were given. The water shut-off didn't affect us as much because we were leaving two days after it began and we're more used to living without hookups than many of the other RVers. Six days would have been a problem for us, though. We filled our tank with enough water for the two days we had remaining and did our laundry in one of the laundry rooms well before the water was shut off. 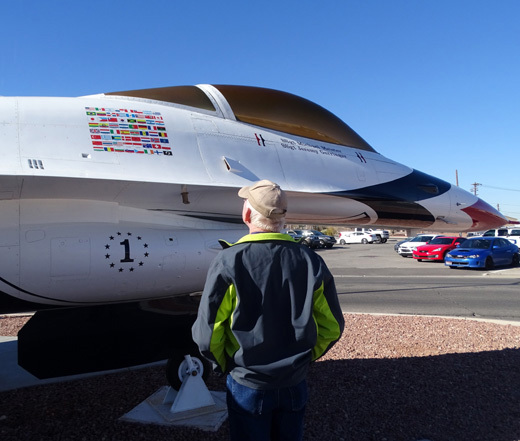 The bright spots during our stay at Nellis AFB were the day trips we took, despite some limitations because of the partial government shutdown. We also went off-base to do most of our shopping. 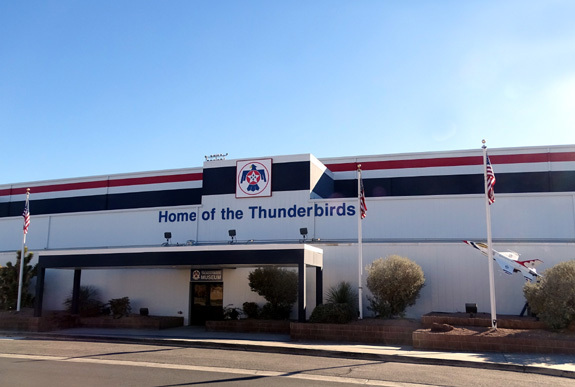 While on base we used the commissary, BX, Subway, and visited the Thunderbird Museum. Noisy F-16s flying overhead were not a problem for us; some visitors complain about noisy F-16s and other aircraft flying around on Air Force bases but we are used to them and like the "sounds of freedom." 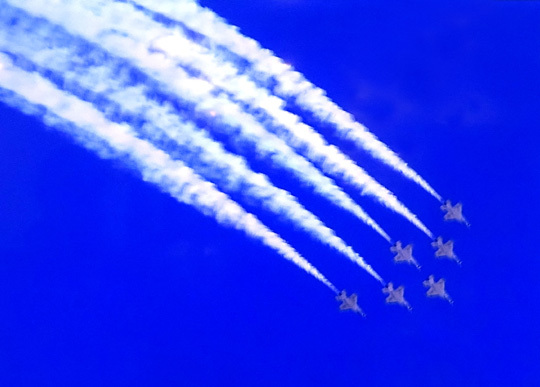 We have been privileged to see the Air Force Thunderbird and Navy Blue Angel demonstration teams perform several times over the years at various military RV parks where we've stayed. We didn't plan any of those times; all were serendipitous occurrences except one repeat visit to the Air Force Academy in Colorado Springs. 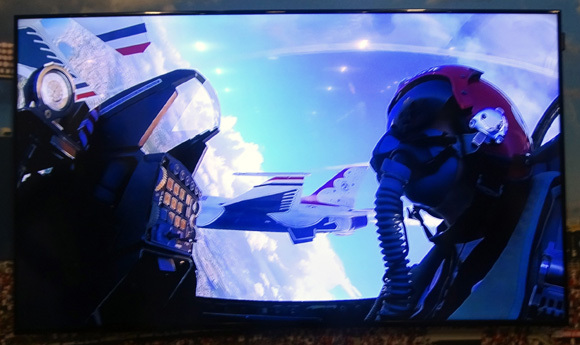 We've seen formal Thunderbird air shows at Ellsworth AFB in South Dakota and at Joint Base Elmendorf-Richardson in Anchorage, Alaska; Thunderbird training before and fly-overs during graduation at the Air Force Academy graduation twice; Thunderbird training here at Nellis AFB this month . . .
. . .	and Blue Angel training at the Naval Air Station in Pensacola, FL on two different trips. 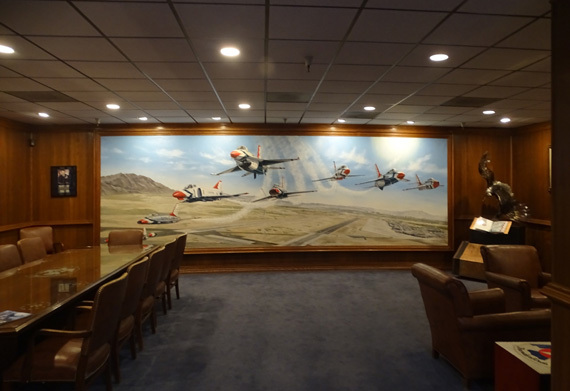 Nellis is the Thunderbird Demonstration Squadron's home base for most of the year. 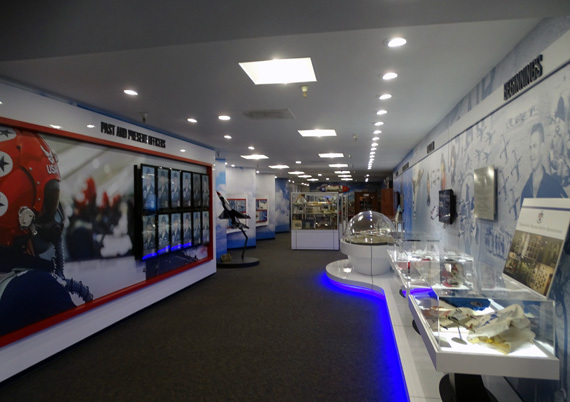 There is a small museum on the main part of the base with exhibits and videos that showcase the history of the team and how the air men and women are trained. 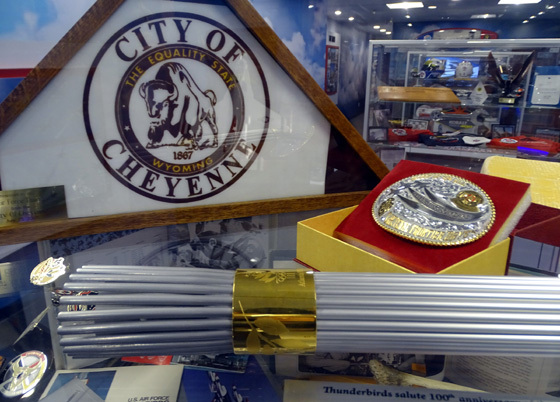 The Thunderbird Museum was closed for remodeling when we were here in 2016 but it was open this time. No one else was there on the weekday we visited. The public can visit the museum with proper ID to get on base. Admission is free. I have one just like it from when I carried the torch in Stone Mountain, GA on the night before the Games opened! That's one of the highlights of my life. I also volunteered at running, cycling, and equestrian events every day of that Olympics. I lived in the Atlanta area from 1974 to 1999, before I met Jim. 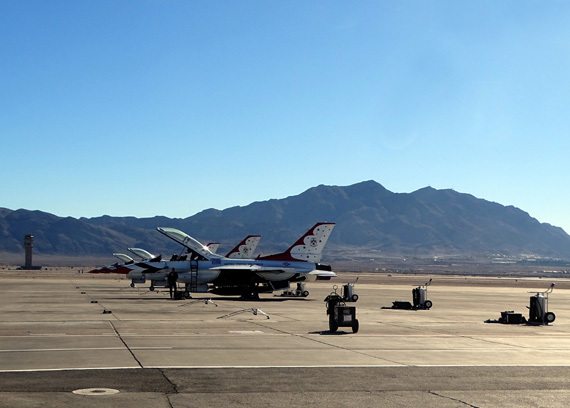 We were able to walk pretty close to the flight line to see some of the Thunderbird's F-16s on the ground. One of the congenial team members who was walking by answered questions we had. 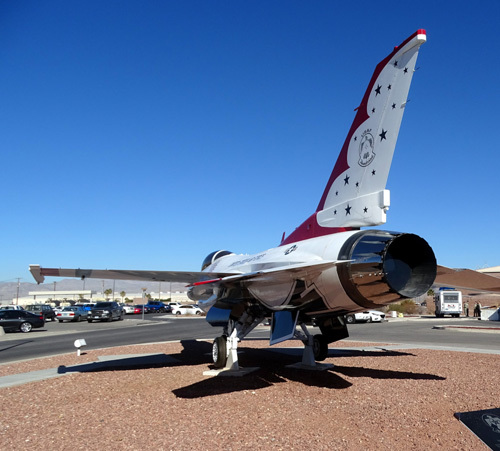 If you're in Vegas and interested in learning more about the Thunderbird Demonstration Squadron, it's worth your time to go on-base and visit this small museum even if you aren't staying at the Desert Eagle RV Park.